The open-air film festival Pluk de Nacht (Seize the Night) has its opening night at the Stenen Hoofd Amsterdam on 16 August. The team behind Pluk de Nacht opens the trading day. The festival will be open daily from 3 pm with a programme of art, food and drinks. In the evening, visitors can relax in a beach chair and enjoy (inter) national feature films, documentaries and animations that have not been shown in the Netherlands before. On Sunday afternoon 20 August, the festival welcomes its youngest fans at Pluk Mini, with activities and films for children aged 2-12 years. Pluk de Nacht Amsterdam runs from 16 to 26 August. Directly after, Pluk de Nacht travels to Utrecht (31 August to 3 September). 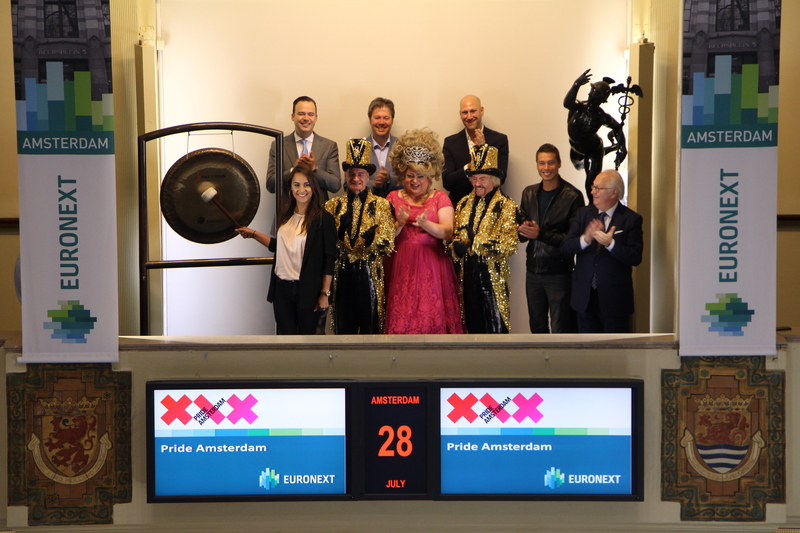 Amsterdam Gay Pride Foundation opens trading together with its ambassadors and a delegation of Rabobank. The sounding of the gong marks the start of Pride Amsterdam 2017. Pride Amsterdam 2017 is held from 29 July until 6 August. This year’s theme is: ‘This Is My Pride’. In order to better serve the LHBTI audiences, to enhance them, be inclusive to everyone and to better promote the festival’s message, the Amsterdam Gay Pride Foundation will issue a record amount of € 125,000, - for purely and only substantive program components. Many people know the Pride Amsterdam festival mainly for the world-famous boat parade, but it is also a nine-day festival with an important message. Pride is a grand party and at the same time an impressive plea for the emancipation of LHBTIs. The Amsterdam Gay Pride Foundation wants to constantly pay attention to human rights in general and the acceptance and equality of LHBTIs in particular, anywhere in the world. Pride Amsterdam offers a range of events in the area of debate, art, theater, film, dance, party and sport with its partners. 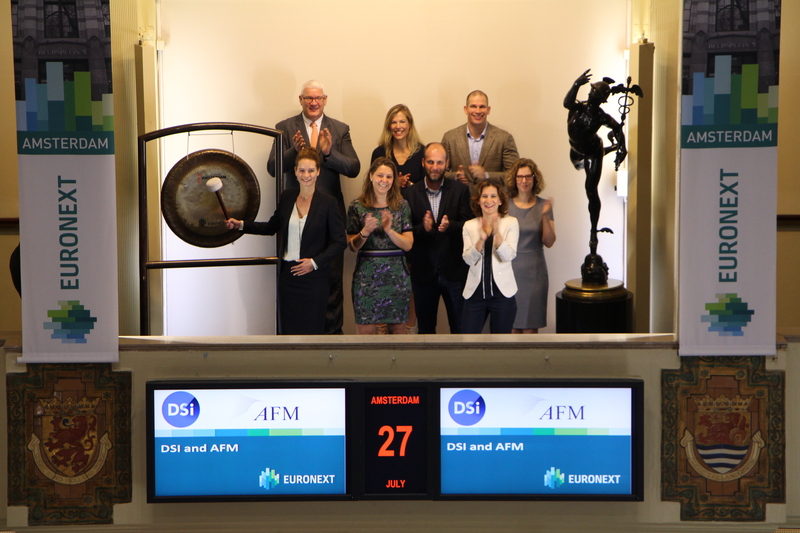 The Dutch financial markets authority AFM and the DSI foundation sound the gong after singing cooperation covenant. Jorine Berends from DSI sounds the gong and opens the trading day. The Dutch financial markets authority AFM and the DSI foundation are to cooperate in the area of appropriate qualifications for investment professionals as necessitated by the ESMA guidelines. DSI will ensure that the relevant investment professionals who are certified by DSI as of 2018 will meet the criteria stipulated by the European Securities & Markets Authority. To this end, DSI and AFM signed a covenant of cooperation in which AFM endorses DSI’s certification programme. Knab's business payment account has been named the most inexpensive account in 2017 for self-employed by MoneyView. It is for the fourth consecutive year that Knab is the only bank to hold the maximum five-star rating for the "Price" item in business payment accounts segment . On this occasion, they visit the Amsterdam exchange. 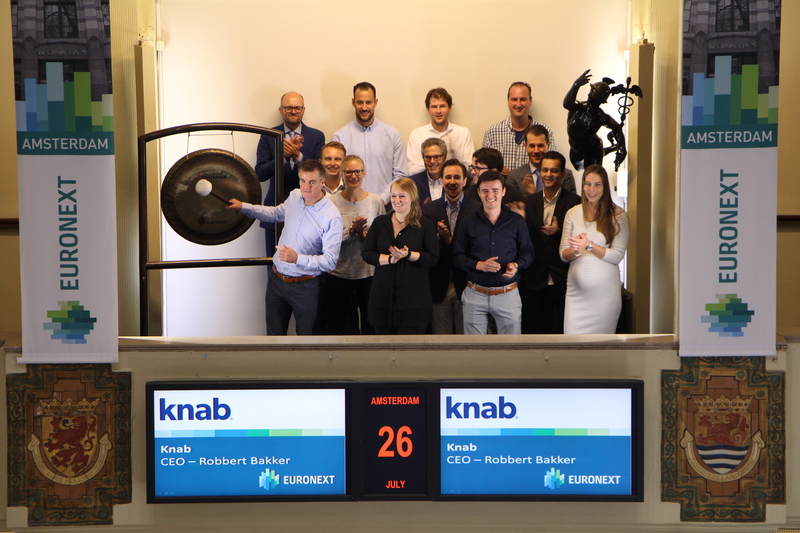 Robbert Bakker, CEO of Knab, opens the trading day by sounding the gong. The survey of corporate payment accounts by the independent benchmark institute MoneyView has been focused on the self-employed this year. The high score of Knab is explained by MoneyView: "Knab is well aware of package costs, credit card costs, and subscription fees for internet banking. In addition, Knab has a credit interest rate and there is an extensive free interest rate. Knab has been stable for five consecutive years in terms of its pricing. " 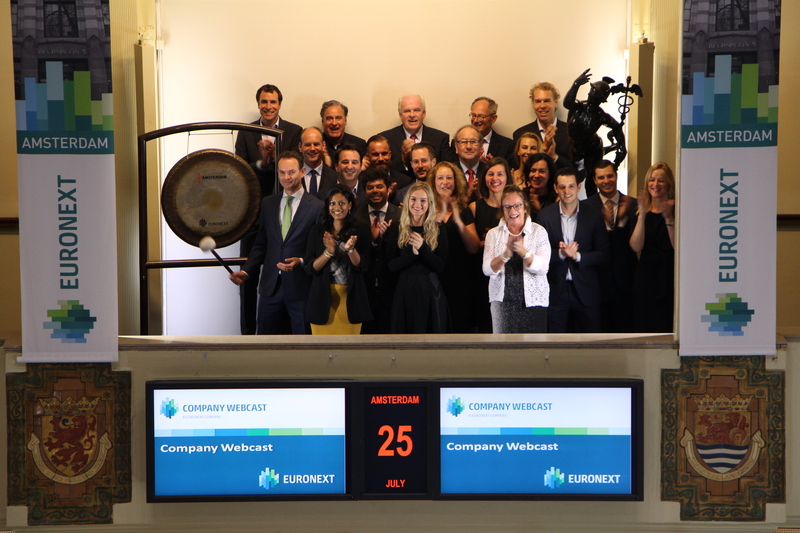 Euronext recently launched its new Euronext Corporate Services offer. Company Webcast’s webcast solutions are a key part of this offering. With the sounding of the gong by Managing Director Olaf Lawerman, Company Webcast highlights its unique Investor Relations webcast services for listed companies across Europe. Research shows that webcasting financial results delivers a better performance in the stock market. It also increases your visibility and boosts engagement among the investor community. This makes webcasting a must-have for efficient financial communication and better market performance. The recently released, cutting-edge Next Generation Webcast Platform offers listed companies higher visibility and greater engagement with shareholders, analysts, investors, and other stakeholders. In addition Company Webcast can measure and report back the impact of every Investor Relations webcast you make with them, making the new Investor Relations webcast services truly the best in the market. Company Webcast is a European market leader in professional webcasts and webinars for Investor Relations. The company produces over 10,000 successful live events each year. Rabobank Foundation celebrates winning the FAO’s international Jacques Diouf Award 2016-2017 with the sounding of the gong. Rabobank Foundation was presented with the award for its efforts to support and economically strengthen small farming communities in developing countries. The award recognises Rabobank Foundation’s many years of dedication to improving the lives and food security of small farmers in developing countries. Global food security is a strategic Banking for Food theme for our organisation. The world population is growing rapidly and the agricultural sector is faces with a huge challenge to continue to meet the increasing demand for food. Rabobank Foundation focuses in developing countries on small farmers who have little or no access to financing and the market. Rabobank Foundation invests in the financial self-sufficiency of cooperatives and helps them on their way to autonomy and independence. It does this by, for example, providing financing and sharing the wealth of cooperative, banking and agricultural knowledge the Rabobank organisation has developed over more than a century. Receiving the award is an acknowledgement that Rabobank’s Banking for Food strategy is of great value and it’s an encouragement to keep doing what they do. 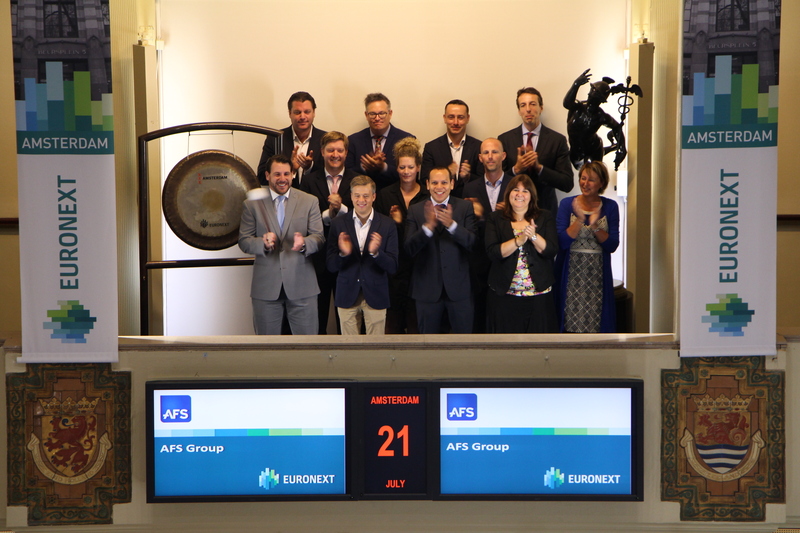 The Fixed Income team of AFS Group, situated at Beursplein 5, opens trading at the Amsterdam Exchange. William Skultety, Senior Fixed Income Sales at AFs, sounds the gong. The in recent years strongly expanded AFS Fixed Income department, operating from Amsterdam and Frankfurt offers institutional investors an all-to-all marketplace for primary & secondary market fixed income investments. Today's gong ceremony reminds market participants of the continued role and importance AFS Fixed Income in providing investment ideas and market liquidity. With its communication strategy for Takeaway.com’s listing at Euronext Amsterdam, Hill+Knowlton Strategies Netherlands won a Golden World Award for Excellence (GWA) in the category Financial Services & Investor Relations. To celebrate this, they visit the Amsterdam exchange and open trading by sounding the gong. These Awards are awarded for work in communication and public relations that meets the highest standards in the field. The international prize is awarded annually by International Public Relations Association (IPRA), the global professional association for communication professionals. 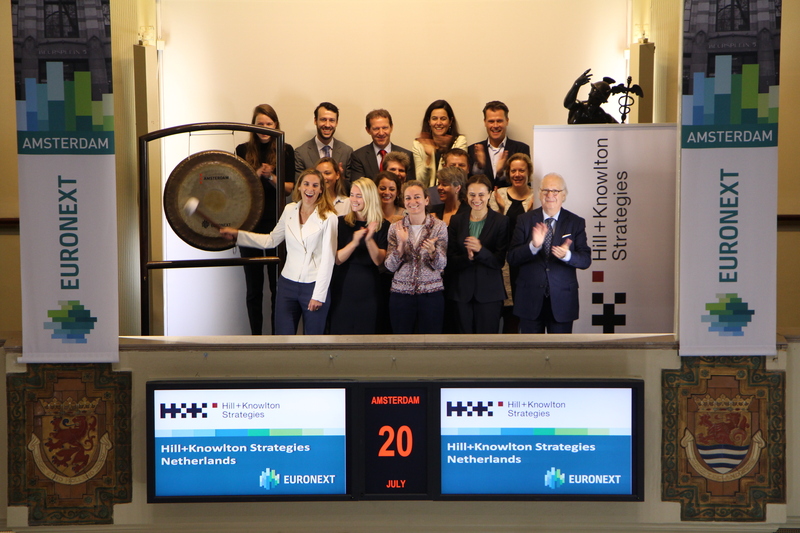 Hill+Knowlton, a leading communications advisory agency in the Netherlands since 1972, developed the communication strategy for the successful listing of Takeaway.com at Euronext Amsterdam. An important part was to highlight the company, the international growth strategy, the business model and the most important investment criteria of Takeaway.com with all relevant stakeholders. The communication strategy and guidance by Hill+Knowlton caused unrivaled attention from media and opinion leaders and support from investors and other key stakeholders for Takeaway.com's listing. Hardt was founded as a company by a number of the winners from Elon Musk’s hyperloop competition that was held earlier this year. Together with the European construction company BAM (ticker symbol: BAMNB), they have built Europe’s first hyperloop test facility to test the technology for this futuristic transport system. 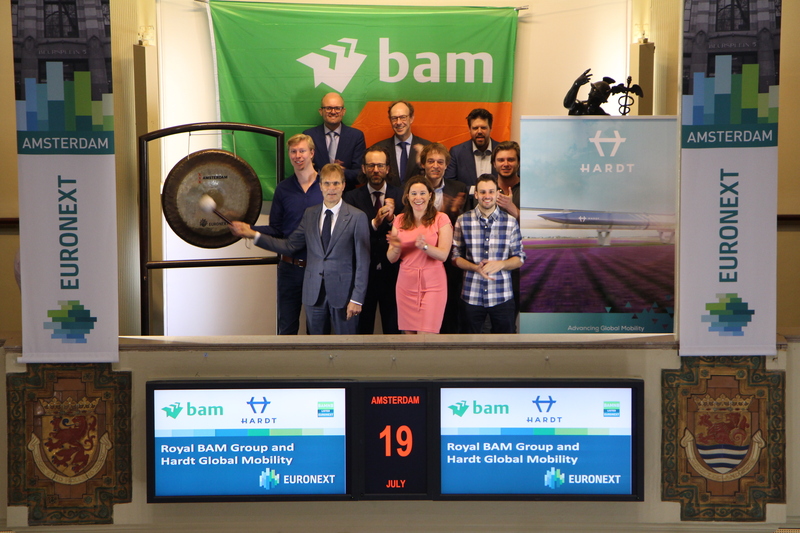 On this occasion they open trading at the Amsterdam exchange. Euronext Paris listed BNP Paribas (ticker symbol: BNP) was named “World’s Best Bank for Corporates” for 2017 by Euromoney, the leading financial publication. The global accolade was one of six awards won in total by BNP Paribas. On this occasion they open trading at the Amsterdam exchange. Overall, BNP Paribas won the following six awards: World’s Best Bank for Corporates, Best Digital Bank in Western Europe, Best Investment Bank in Belgium, Best Bank in France, Best Bank in Kosovo, and Best Bank in Luxembourg. 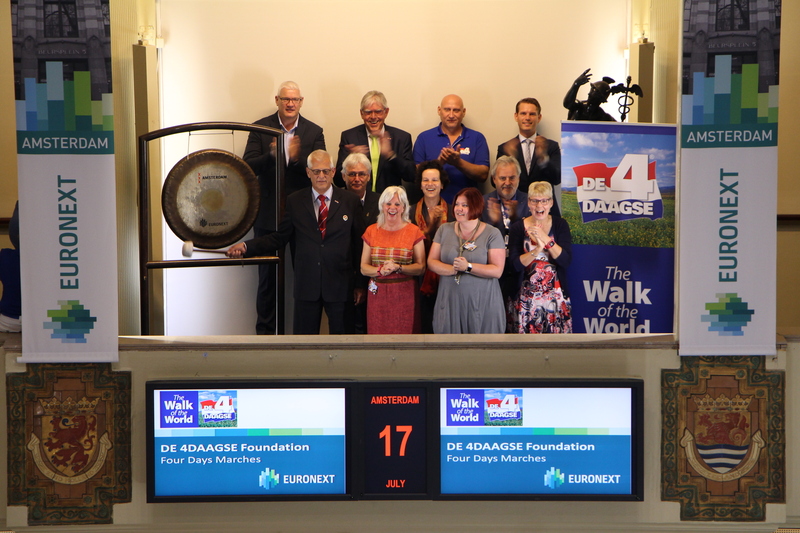 Johan Willemstein, Chairman Stichting DE 4DAAGSE, sounds the gong to celebrate the start of the 101st Four Days Marches. The Four Days Marches are a walking achievement event for four consecutive days, in which annually tens of thousands walkers are participating. On those days, people from all over the world come to Nijmegen to walk in and around the city and its beautiful wooded surroundings. Hundreds of thousands of spectators are cheering on the walkers along the route every day. After four days of walking, a glorious entry along the Via Gladiola awaits the walkers, followed by the distribution of their well-deserved Four Days Medal. In 2017 at the 101st edition of the event, some 45,000 participants will attend. From some 70 countries participants come to Nijmegen to walk four days respectively 30, 40 or 50 kilometers per day. The 101th edition of the Four Days Marches will start Tuesday 18 April at 4 a.m. The North Sea Foundation (Stichting de Noordzee) kicks off the fifth Boskalis Beach Cleanup Tour. Floris van Hest, General manager Stichting de Noordzee, sounds the gong. From August 1st till 15th the North Sea Foundation organizes the Boskalis Beach Cleanup Tour where the entire Dutch North Sea coast is cleared of waste. The Cleanup kicks off simultaneously in Cadzand and Schiermonnikoog. Volunteers take on 30 stages in 15 days, where half walk towards the north, the other half towards the south of Holland. After two weeks the two teams meet and finish the Cleanup in Zandvoort. Those interested can register for one or multiple stages online. Together with 6.377 volunteers, the North Sea Foundation cleared 57.426 kilos off the Dutch beaches, since the first edition in 2013. This boils down to over 10.000 waste bags full of waste. The North Sea Foundation is an environmental non-governmental organisation (NGO) advocating the protection and sustainable use of the North Sea marine ecosystem. The goal is a clean, healthy sea and a well-functioning ecosystem. Its activities are focused on clean seas and beaches, clean shipping, sustainable fisheries, eco-friendly sustainable energy and marine protected areas. 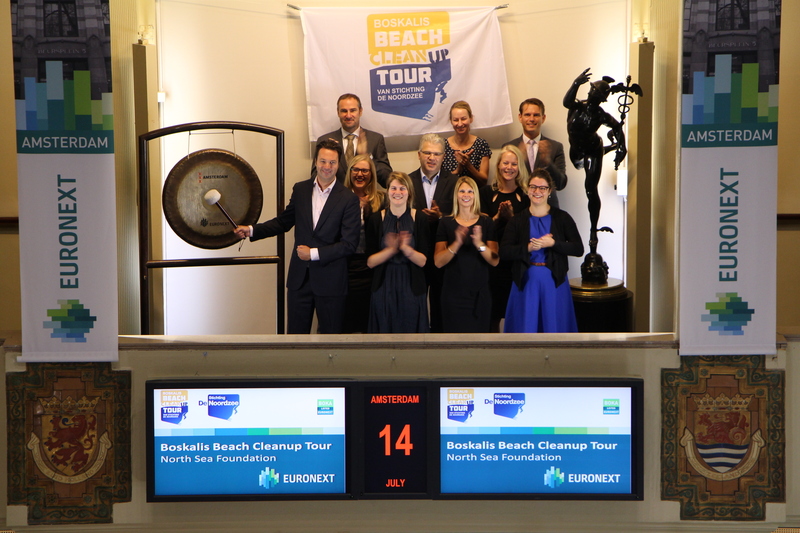 The Boskalis Beach Cleanup Tour is made possible by the support of their main sponsor and partners. 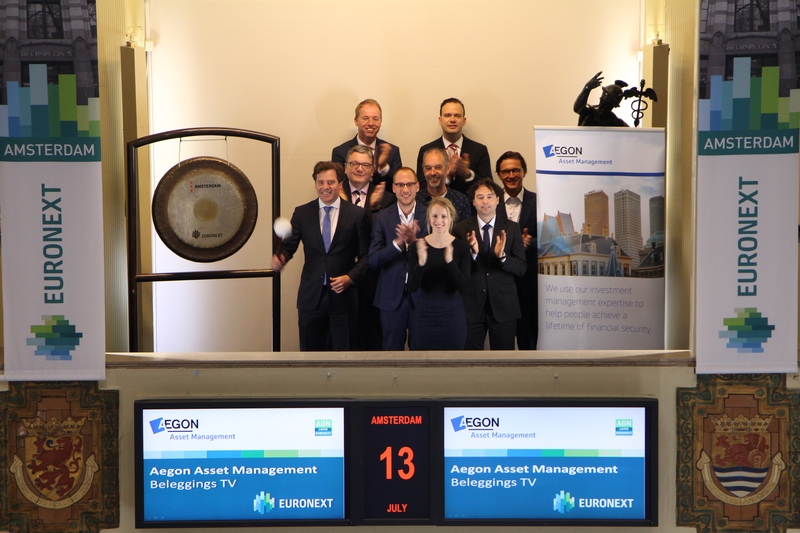 The editors of Aegon Beleggings TV (Aegon Investment TV) open the trading day, consequently they will film the 100th episode at the Amsterdam exchange of Euronext. Olaf van den Heuvel, Aegon Asset Management, who is the talking head in most of the episodes thus far, will sound the gong. How best to explain a major economic crisis? This question triggered the first episode of Aegon Beleggings TV (Aegon Investment TV) back in November 2009. Having to explain complex matters in front of a camera, forces one to be concise and plain simple. It worked, and it has been Aegon’s concept for all 99 episodes. Talking about political and economic developments and how they influence stock markets – all in a couple of minutes. Chief Risk Officer and co-owner of Algorithmic Trading Group (ATG), Jelper Striet, opens trading by sounding the gong. 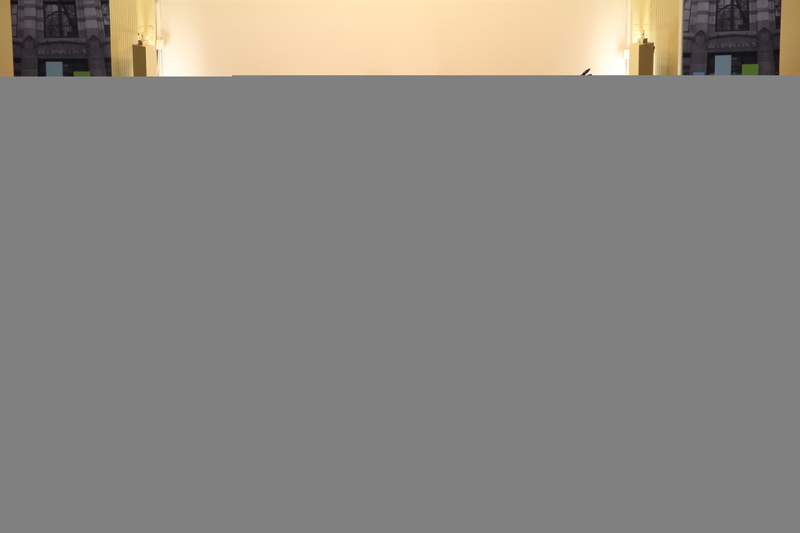 ATG celebrates its recent relocation to Beursplein 5. ATG is a young trading company founded in October 2008 in Hong Kong, by Bob Collin, Chun Wing Man, and Tom Voûte . ATG specializes in algorithmic trading on the major financial markets around the world. ATG has offices in Hong Kong and the Netherlands. 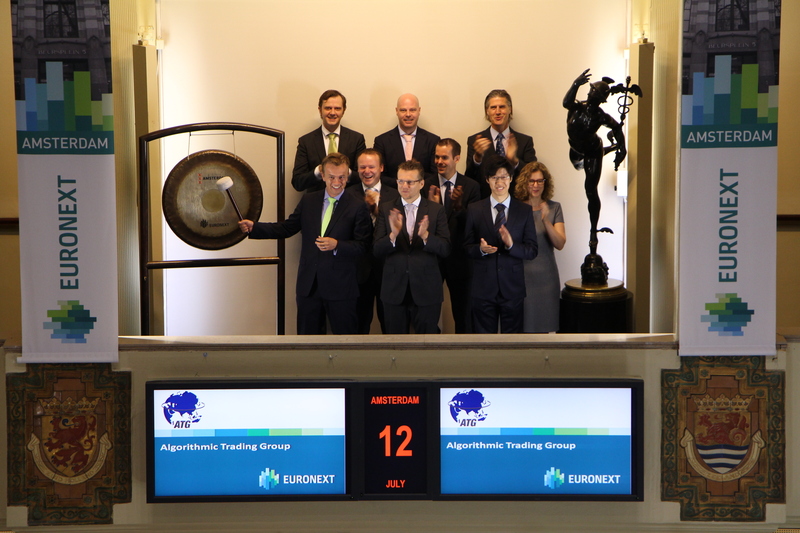 Arcadis’ Chief Digital Officer (CDO) Julien Cayet sounds the opening gong at Euronext Amsterdam with the digital leadership team to celebrate a number of recent successes in its digital transformation. Julien Cayet has been announced as the company’s CDO. Subsequently, a multidisciplinary team has been formed to build a digitally-enabled business. The core team – whom will work closely with the office of the Chief Information Officer – comprises the CDO and leaders in BIM/digital asset lifecycle, digital innovation, data analytics and insights, ecosystem partnerships, marketing & communications and human capital. The team has seen a number of successes including the launch of its first design thinking innovation program Deep Orange and recognition for its digital transformation in Het Financieelee Dagblad ranking Arcadis #1 in the sector, #2 in culture and 6 out of 200 Dutch companies, according to Vlerick Business School’s FD Transformers 200 report. The sounding of the gong to open the trading day at the Amsterdam exchange is to call attention to The New Champions of 2017, an inventory of promising young companies with ground breaking products or services. 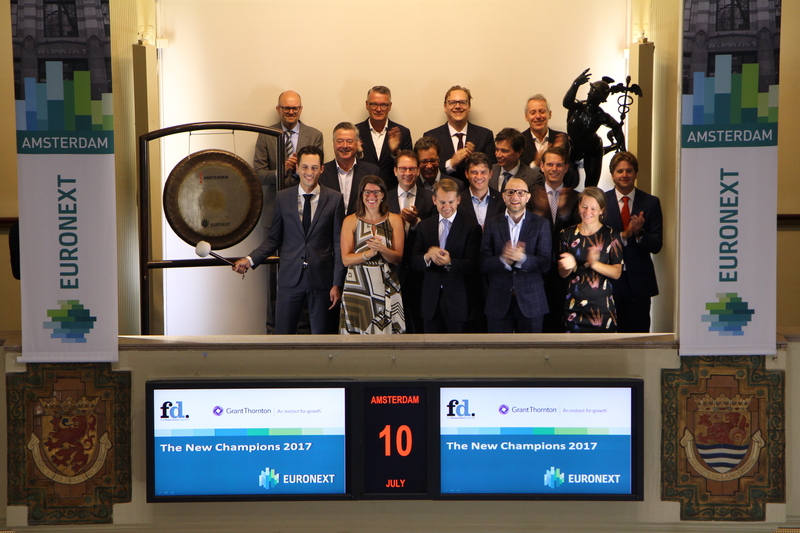 In a series of portraits in the financial daily Het FD, online and in reports on BNR Newsradio, we have highlighted these new champions in Dutch business. The 2017 nominees are innovative in energy, mobility, robotics, logistics, high tech and financial sectors. They show healthy growth in sales, jobs, investment or otherwise. And they have the potential to conquer their industry. The eight nominated New Champions 2017 are: Additive Industries, Brand New Day, Five Degrees, Heliox, One of a Kind Technologies, SendCloud, Ultimaker, and Vandebron. The gong is sounded by Additive Industries, which was declared ‘New Champion of 2017’ by the expert panel of the project, accompanied by Heliox, winner of the public vote, and the members of the New Champion 2017 team, consisting of representatives of Het Financieele Dagblad and Grant Thornton, sponsor of the New Champion project. The trading day is opened by Nationaal Fonds Kinderhulp. 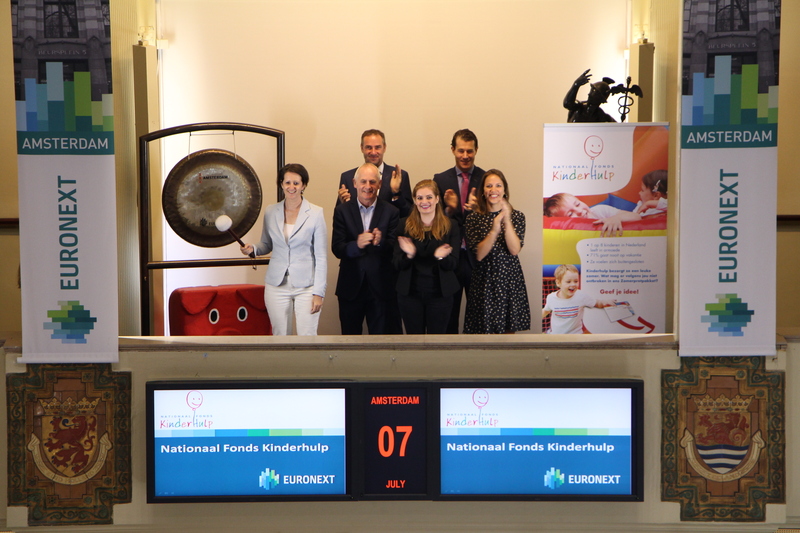 By sounding the gong, Chantal van Gool, Hoofd fondsenwerving Nationaal Fonds Kinderhulp, brings their new ‘Zomerpret’ (Summerfun) campaign to the attention. Kinderhulp states that summer vacation is usually something to look forward to, but the 1 out of 8 children who grow up in poverty are not looking forward to it at all. For the children who don’t live at their parental house anymore it’s even more difficult. They do not go anywhere and experience few other fun things. When they go to school again, they have little stories to tell and feel left out. That’s why Kinderhulp introduces the ‘Zomerpretpakket’, which main goal is: giving children in poverty a nice summer holiday. They will be doing that by distributing ‘Summer boxes’ with various items, for good and bad weather, to get through the summer. For example: toys, books, a cinema voucher, a beach ball, sunscreen, a trip to a theme park, school supplies and DIY-ideas . The sounding of the gong brings attention to The Finance Run, a sporting and informal networking event in the financial services industry. The profits will be donated to Stichting LEF. LEF stands for Leven En Financiën (Living and Finance). Their goal is to increase financial awareness among youngsters. This year the Finance Run will take place on Friday 1 September at the Bosbaan at the Amsterdamse bos. Over 1.000 finance professionals are expected to participate, either on behalf of their company or individually. This year will be the fourth edition. The number of participants - and thereby the profits for LEF – have grown considerably over the years. The success can partially be attributed to a large number of sponsors and media partners. Rijksmuseum and their main sponsor ING sound the gong to open the summer season. The summer exhibitions at the Rijksmuseum include the free accessible exhibition of Jean Dubuffet in the gardens of the Rijksmuseum, medieval carving art at Small Wonders and a major retrospective of 19th century photography at the exhibition New Realities. 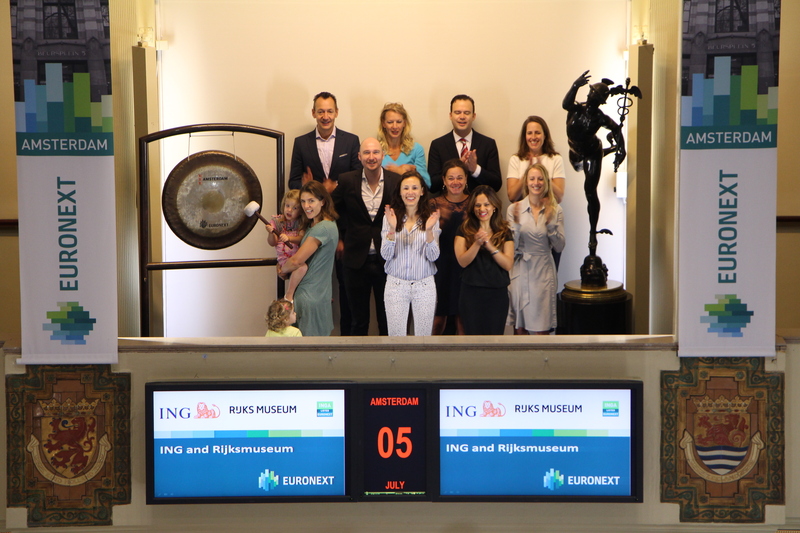 Since 2005, Euronext listed, ING and Rijksmuseum have been working closely in attracting a broad audience to the museum and strengthening the relationship with Dutch visitors. The ING Rijksmuseum days e.g. offer ING customers a chance to get acquainted with the Rijksmuseum. In addition, ING is also sponsor of Rijksmuseum Schiphol, this one of a kind venture is the first art museum at an airport located beyond the passport control. The gong is sounded by The Challenge Finance winner Krista Luijten. The Challenge Finance is an interactive event organized by Yacht Finance, Het Financieele Dagblad and BNR Nieuwsradio. The Challenge is an interactive live business event where four selected professionals compete for the win in their field. This concept fully fits the Yacht idea that professionals want to matter, want to make the difference for their organization, their field of study and for society. This edition of The Challenge Finance revolved around the question of which financial actions should be taken to ensure that scale-up Bloomon will become the first global flower brand, with the starting point: realizable, scalable and innovative. The client, the jury and the audience eventually chose Krista Luijten, working as Product Owner Risk Innovation at ABN AMRO, as Best Finance Professional 2017. 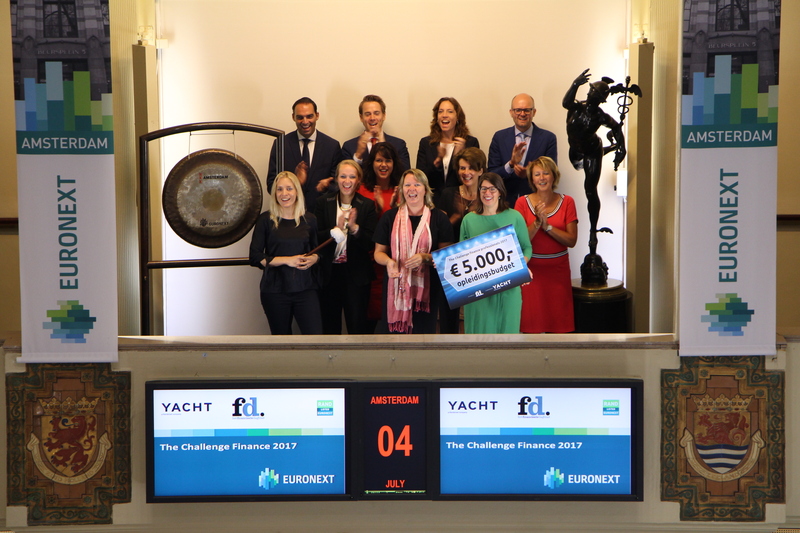 Prior to The Challenge Finance 2017, The Financieele Dagblad and Yacht The Challenge have already organized two editions in 2016. The next Challenge, focused on the IT sector, is scheduled for November 2017. 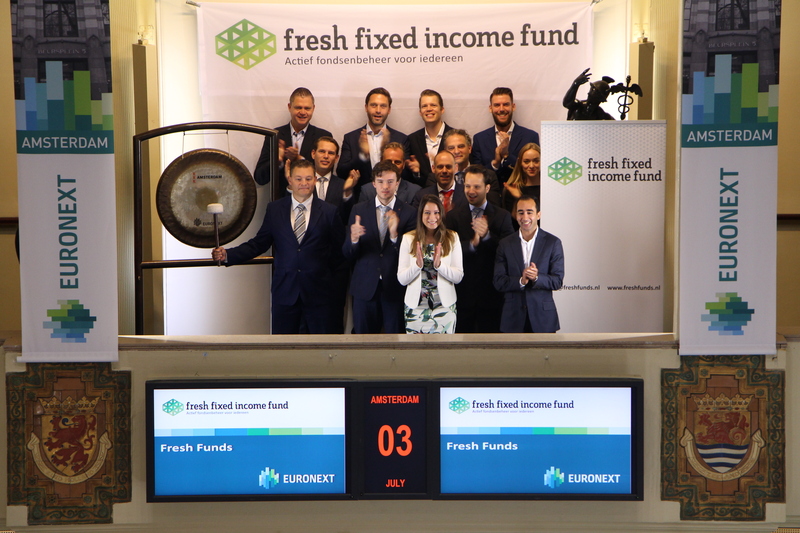 Fresh Fixed Income Fund sounds the gong to celebrate its one-year anniversary. The fund allows investors the opportunity to invest in an active and professionally managed portfolio in fixed income. The primary objective is to subscribe to new issues. Those bonds frequently offer an extra premium and can be purchased without bid and offer spread. Both of these factors benefit the return. Fresh Fixed Income Fund is the first investment fund under the Fresh label of AIFMD manager OHV Institutional Asset Management BV. The fund kicked off with seed capital of € 27.7 million. Currently the assets under management have grown to € 67.5 million. Net return since inception is more than 4 percent.